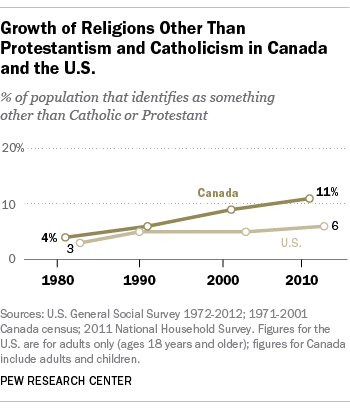 While there are some similarities, there also are important differences between the religious trends in Canada and the U.S. 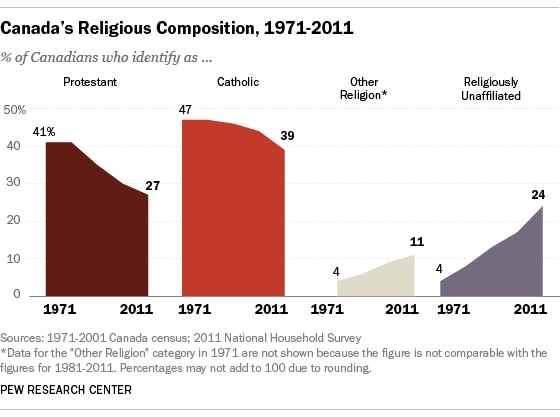 In Canada, both the Catholic and Protestant shares of the population have been falling (see Canada’s Religious Composition, 1971-2011 graph above). In the United States, by contrast, the Catholic share of the population has held fairly steady in recent decades (at roughly one-quarter), while the Protestant share has been declining, falling from more than two-thirds of U.S. adults in the 1960s to about 50% today. Moreover, regional variations in disaffiliation are greater across Canada than across the United States. For instance, the share of the population that is religiously unaffiliated in British Columbia in Western Canada (44%) is more than twice as high as the share in Atlantic Canada (16%) and three times higher than in Quebec (12%), according to Statistic Canada’s 2011 National Household Survey, the most recent data available.7 In the United States, by comparison, the percentage of unaffiliated adults in different regions is closer, ranging from 26% in the Western states to 15% in the South, according to aggregated data from Pew Research surveys conducted in 2012. Both in Canada and in the United States, an important factor behind the growth of the religiously unaffiliated is generational replacement, the gradual supplanting of older generations by newer ones.8 Recent generations of Canadians are significantly less affiliated than earlier generations. For example, 29% of Canadians born between 1967 and 1986 have no religious affiliation as of 2011, 17 percentage points higher than Canada’s oldest living generation (born 1946 or earlier) and nine points higher than Canadians born between 1947 and 1966. Canadians born between 1987 and 1995 – which includes the youngest generation of adults, who are still coming of age – have rates of disaffiliation similar to the previous generation of Canadians (29% unaffiliated, as of 2011) as well as to the youngest cohort of Americans for which data is available (ages 18-29); a third (32%) of the U.S. cohort is unaffiliated, as of 2012). In Canada, disaffiliation has increased markedly within some generations as they have aged. For example, one-in-ten Canadians born between 1947 and 1966 had no religious affiliation in 1981, but one-in-five are unaffiliated as of 2011. Even Canada’s older adults (those born in 1946 or earlier) have experienced gradual increases in disaffiliation; their rate of disaffiliation has gone from the single digits in the 1970s to double digits in recent years. In the U.S., by contrast, the share of people with no religious affiliation has been fairly stable within each generation over time (though disaffiliation has ticked up slightly among American Baby Boomers – those born between 1946 and 1964 – and Gen Xers – those born between 1965 and 1980). The rise of the “nones” in Canada, as in the United States, has cut across many demographic groups. It has taken place among women and men; college graduates and people with less education; immigrants and non-immigrants; and younger, middle-aged and older adults. At the same time, there are some significant differences in rates of disaffiliation within each of these groups. For example, Canadian men (like U.S. men) are more likely to be unaffiliated than their female counterparts. About 26% of men and 22% of women in Canada have no religious affiliation as of 2011. College-educated Canadians are somewhat less likely to have a religious affiliation than Canadians without a college degree. This difference, however, has narrowed over time, from an eight-point gap in 1971 (12% of college graduates vs. 4% of those with less education) to a two-point gap in 2011 (23% of college graduates vs. 21% of those without a college degree). In addition, the gap between younger Canadians and older adults has been growing. In 1971, the percentage of Canadians with no religious affiliation was about the same among younger, middle-aged and senior adults. But as of 2011, 29% of young adults (ages 25-44) have no religious affiliation, compared with 20% of middle-aged adults (ages 45-64) and 12% of senior adults (ages 65 and older). The demographic profile of the religiously unaffiliated in Canada is similar to their profile in the United States: In both countries, young adults, males, single adults and college graduates are more likely to be religious “nones” than older adults, females, married people and those with less education – though disaffiliation has occurred among all these groups of Canadians. A marked increase in disaffiliation also has occurred in Canada’s Prairie provinces and in Ontario, where about one-in-twenty residents (5%) had no religious affiliation in 1971; as of 2011, about a quarter of Ontario (23%) and Prairie residents (29%) are religiously unaffiliated.12 The share of religious “nones” is lower in Atlantic Canada, where it has risen from 2% in 1971 to 16% in 2011. The lowest rate of disaffiliation is in the province of Quebec, which is known for its Roman Catholic roots. From 1971 through 2001, the share of Quebec’s population with no religious affiliation changed slowly. But in the past decade, the share of the province’s population that has no religious affiliation climbed sharply, reaching 12% of Quebec residents in 2011. As the geographic origins of Canadian immigrants have shifted, so has their religious makeup. A majority of immigrants (56%) who arrived during the 1970s were either Catholic or Protestant, while about a quarter were affiliated with other religious traditions, including Eastern Orthodox Christianity, Islam, Buddhism, Sikhism, Hinduism, and Judaism. Since 2001, about four-in-ten (39%) new Canadian immigrants have belonged to these religious minorities, the same as the share of new immigrants (also 39%) who identify as either Catholic or Protestant. Because immigrants comprise more than a fifth of Canada’s population, the rising share of immigrants who belong to religious minorities has had a substantial impact on the religious composition of the overall population. The growth of minority faiths, however, has not occurred to the same extent across all of Canada. Rising numbers of immigrants in metropolitan areas such as Toronto, Vancouver and Montreal has made these cities (and their provinces) particularly religiously diverse. Ontario has experienced the most significant increase in affiliation with minority religions. The share of Ontario residents who identify with faiths other than Protestantism or Catholicism has risen from about 5% in 1981 to 15% in 2011. Nearly as many British Columbians (12%) belong to these other religions. Religious minorities make up somewhat smaller shares of the public in Canada’s Prairie provinces (8%) and Quebec (7%), while only about 2% of the population in Canada’s Atlantic provinces belong to non-Protestant or non-Catholic faiths, as of 2011. Like the rising number of religiously unaffiliated adults, the decline in attendance at religious services is driven in part by generational replacement. Younger generations of Canadians report attending religious services less frequently than do older generations.16 This is seen clearly when Canadians are divided into 10-year cohorts by year of birth. For example, 43% of Canadians born between 1934 and 1943 reported that they attended religious services at least once a month in 2008. But only 31% of the subsequent cohort (born 1944-1953) said they attended religious services monthly or more in the same year. Younger cohorts (born 1954 and later) reported attending religious services even less frequently. In addition, self-reported rates of attendance have been dropping in some cohorts over time. 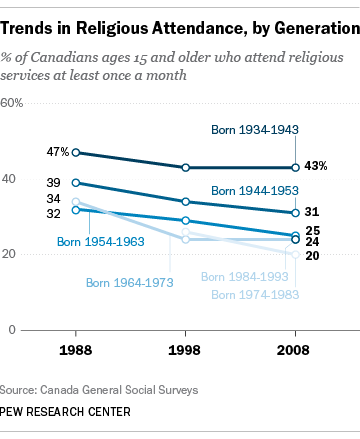 For example, in the 1988 Canadian General Social Survey, nearly four-in-ten Canadians (39%) born from 1944 to 1953 said they attended religious services at least once a month. Two decades later, in 2008, 31% of the same cohort reported attending religious services that often. Similar declines have occurred in other generations of Canadians. While immigration has contributed to the rise of Canada’s “nones,” immigrants do not appear to have contributed to Canada’s decline in self-reported attendance at religious services. 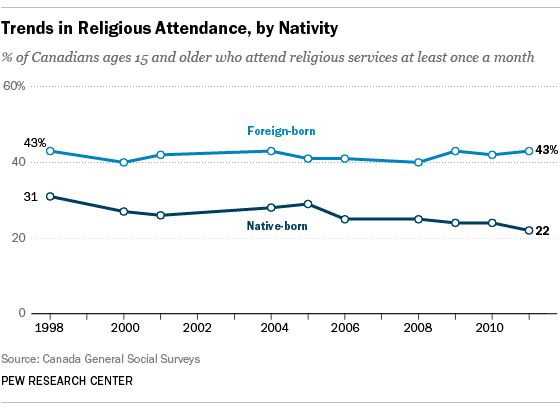 On the contrary, religious attendance is higher among immigrants than among the general public, and it has been fairly stable: 43% of immigrants report in 2011 that they attend religious services at least once a month, the same share as in 1998. By contrast, 22% of native-born Canadians in 2011 say they attend religious services at least once a month, down from 31% in 1998. 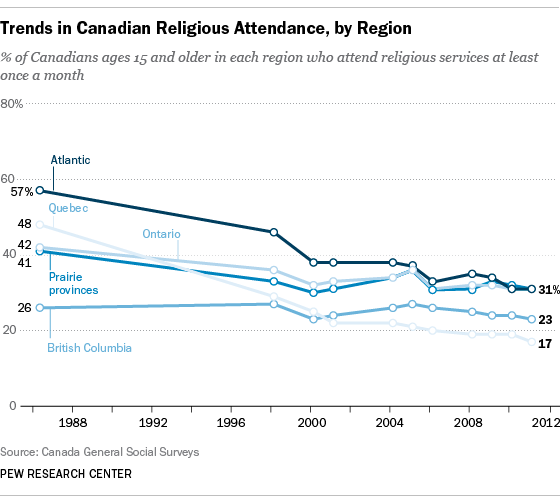 Like disaffiliation, the decline in religious attendance in Canada has been greater in some regions than in others. In Canada as a whole, the share of the population that reports attending religious services at least once a month dropped by 16 percentage points between 1986 and 2011, according to Canadian General Social Surveys. In Canada’s Atlantic provinces, the decline over the same period was 26 points. Quebec also experienced a steep decline: In 1986, nearly half (48%) of Quebec residents said they attended religious services at least once a month. By 2011, about one-in-six Quebecers (17%) reported attending religious services at least once a month, a drop of 31 points. Declines in self-reported church attendance have been less substantial in Ontario and the Prairie provinces. Several of these provinces had about a 10-point fall-off in religious attendance rates between 1986 and 2011. However, attendance rates have remained fairly stable in British Columbia, albeit at a comparatively low level. In 2011, about a quarter of British Columbians (23%) said they attended religious services at least once a month, about the same as in 1986 (26%). The Canadian data used for estimates in this report come from three sources – the Canadian census (1971, 1981, 1991 and 2001), the 2011 National Household Survey, and Canadian General Social Surveys (1986, 1988, 1998, 2000, 2004, 2006, 2008, 2009, 2010 and 2011). Canadian Census. Unlike the U.S. census, the decennial Canadian census included a question about religious affiliation through 2001. The census estimates in this Pew Research report were drawn from a microdata subsample of the Canadian census downloaded from the Minnesota Population Center’s Integrated Public Use Microdata Series, International: Version 6.1 [Machine-readable database]. National Household Survey. The 2011 National Household Survey (NHS) collected information about religion. Unlike in previous decades, when a religion question was included in the census, in 2011 it was part of a voluntary survey among 4.5 million randomly selected households, of which roughly 2.65 million households participated in the survey. Statistics Canada has indicated that some groups – immigrants, ethnic minorities, non-English or non-French speakers and aboriginals – may be underrepresented among participants in the voluntary survey. Despite these challenges, the NHS represents the best data source for religious affiliation in Canada in 2011. NHS survey estimates are available from Statistics Canada’s website. Canadian General Social Surveys. Canada’s General Social Surveys are nationally representative, annual surveys conducted by Statistics Canada. Each wave contains 20,000 or more interviews. Surveys are conducted by telephone in English and French, targeting Canadians ages 15 and older living in Canada’s 10 provinces. Public data sets were obtained from Statistics Canada for 2000, 2004, 2006, 2008, 2009, 2010 and 2011. All computations on these microdata were conducted by the Pew Research Center,and the responsibility for the use and interpretation of the data is entirely that of the author. Religious attendance estimates for 1986, 1988 and 1998 were drawn from a 2000 Statistics Canada report by Warren Clark. U.S. estimates were drawn from General Social Surveys (1972, 1980, 1988, 1990, 1998, 2000, 2004, 2006, 2008, 2010 and 2012).17 The General Social Survey in the U.S. is a project of the independent research organization NORC at the University of Chicago, with principal funding from the National Science Foundation. Canada’s Atlantic Provinces. In the census data set, a detailed religion variable for the Atlantic provinces was unavailable for 1991 and 2001; therefore, national estimates for these years do not include these smaller provinces, which account for less than 10% of Canada’s population. Comparisons to Statistics Canada census tables for these years demonstrate few differences in the religious distribution of Canada as a whole when the Atlantic provinces are excluded. All census estimates use Statistics Canada population weights. Age Groups. Comparisons between Canadian General Social Surveys and U.S. General Social Surveys are not exact because Canada’s GSS includes respondents ages 15-17, while the U.S. GSS represents adults 18 and older. Because the public data files for Canada’s General Social Survey are divided into 10-year segments, respondents younger than 18 could not be excluded from the analysis. However, people ages 15 to 17 make up less than 5% of Canada’s population, and their exclusion from this analysis would not substantially alter general findings. Additionally, it is important to note that estimates from the Canadian census are for the entire population, while U.S. survey estimates are only for adults 18 and older. Religion Questions. GSS questions on religion are different in Canada and the U.S. The religious affiliation question in the Canadian census and the 2011 National Household Survey is, “What is your (or this person’s) religion?” Canadians are provided with some response options but can also write in a response. By contrast, the U.S. General Social Surveys ask, “What is your religious preference? Is it Protestant, Catholic, Jewish, some other religion, or no religion?” For religious attendance, the Canadian General Social Surveys ask, “How often do you attend religious services in the past 12 months? Was it at least once a week, at least once a month, a few times a year, at least once a year, or not at all?” In the U.S. GSS, religious attendance is measured with the question, “How often do you attend religious services?” with probes for attendance levels provided by the interviewer when necessary. Religiously Unaffiliated. In earlier years, the Canadian GSS did not ask religiously unaffiliated respondents about attendance at worship services. In recent years, about 3% of Canadians with no religious affiliation have said they attend services at least once a month. Consequently, it appears to be unlikely that religious attendance estimates for Canada in the earlier years would have been markedly different if the unaffiliated had been asked about their religious attendance. Bibby, Reginald. 2011. “Continuing the Conversation on Canada: Changing Patterns of Religious Service Attendance.” Journal for the Scientific Study of Religion. Volume 50. Pages 831-839. Clark, Warren. 2006. “Who’s religion?” Canadian Social Trends. Summer 2006. http://www.statcan.gc.ca/pub/11-008-x/2006001/pdf/9181-eng.pdf. Clark, Warren. 2000. 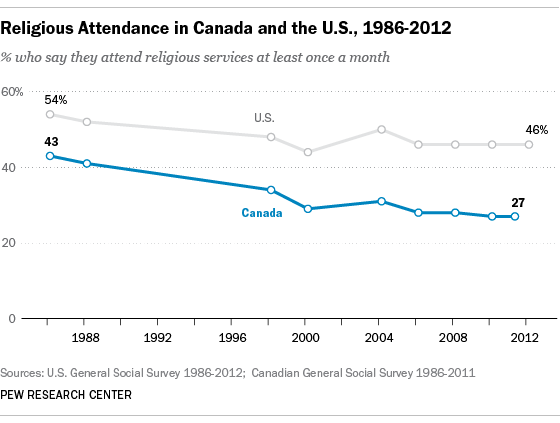 “Patterns of religious attendance.” Canadian Social Trends. Winter 2000. http://www.statcan.gc.ca/pub/11-008-x/2000003/article/5389-eng.pdf. Eagle, David. 2011. “Changing Patterns of Attendance at Religious Services in Canada, 1986-2008.” Journal for the Scientific Study of Religion.Volume 50. Pages 187-200.